CHENNAI: “Ronaldo!” shout the young boys and a couple of girls, as they run onto the field in their jerseys for their warm-up session. Santhome Superstars, Besantnagar Bravehearts and Udamalpet Warriors — this league has no film actors or industrialists, but is a team of children from fishing communities, slums and homeless shelters. Gamesa Soccer League is an unusual collaboration between Gamesa, a company involved in wind energy generation and Slum Soccer, an NGO that aims at changing the lives of underprivileged kids through sports. With the launch of this initiative on Friday at the Madras School of Social Work, seven teams have been adopted by Gamesa across wind farm sites in Tamil Nadu and Maharashtra. They will be trained professionally to compete in a final match to be held in Chennai mid-2015. “When we were in school, the sports period was the one that was expendable; the one that would be replaced by special classes. That is the importance we give to sports in our country. 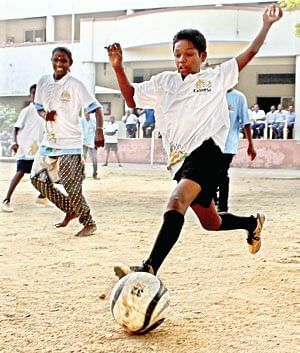 But it’s changing,” said Akshay Madhavan, head of operations, Slum Soccer. The desire to address big problems through sports has made some mark, as the video film of Slum Soccer showed a mother speaking about how she saw her son’s aggression reduce after he began to play football. “Chennai has 945 slums — there is a lot of anger among the underprivileged and the police become the first line of defense. Changing this through sports can be a big positive,” said R Nataraj, former Director General of Police, Tamil Nadu, who was the chief guest at the launch.